A popular song and a recent article in The Wall Street Journal reminded us of Edmund Burke’s quote and how important history is to the long-term success of common stock ownership. At Smead Capital Management, we pride ourselves in learning whatever we can glean from the history of the stock market, because we seek to avoid the mistakes from the past. Let’s use today’s media to learn more about defending our capital and how to seek long-duration equity returns. Matt Nathanson has a very popular song out, titled “Used to Be,” where he invites an old girlfriend back into his life. 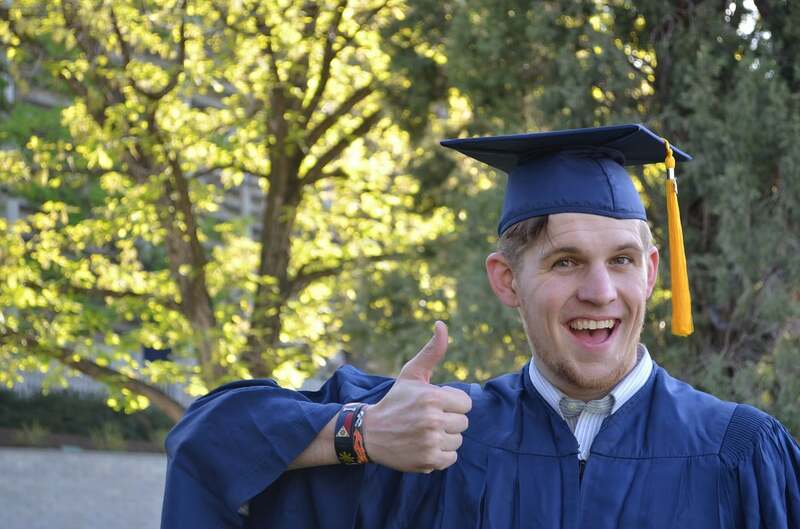 His refrain is “I’ve got a king-sized bed and a Ph.D. in the way it used to be.” In most of life, being stuck in the way things used to be isn’t always an asset. In investing, it is very helpful to avoid participating in a mean-reversion, which damages capital permanently. I’m referring to stocks that trade for the lowest ratios of price to book value. Groundbreaking research by University of Chicago finance professor (and Nobel laureate) Eugene Fama and Dartmouth professor Ken French found that such stocks over the long term have significantly outperformed so-called growth stocks—those with the highest such ratios. 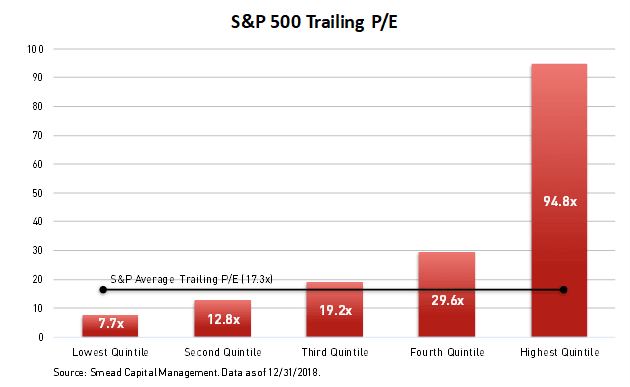 They report that, from 1926 through 2018, the 20% of stocks at the value end of the spectrum have beaten the quintile at the growth end by 3.6 annualized percentage points. 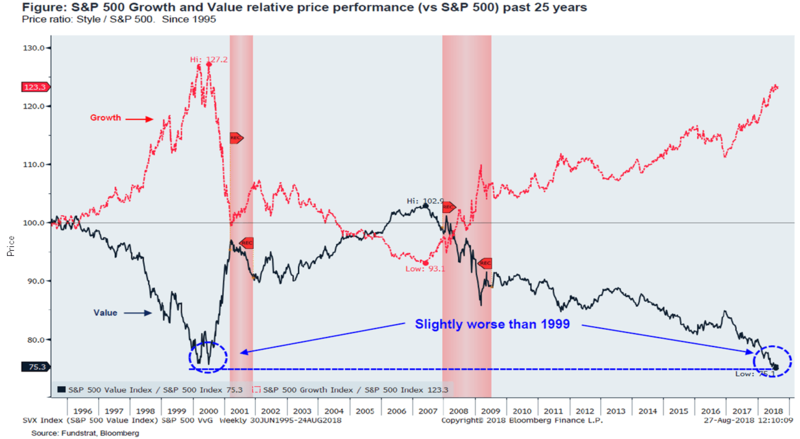 To be sure, value stocks are coming off a decade in which they have significantly lagged behind growth, leading some to speculate that the so-called value effect no longer exists. Source: Fundstrat August 29, 2018. According to a new study circulated a few weeks ago by the National Bureau of Economic Research, there are hardly any mutual funds or ETFs that consistently invest in the quintile of stocks with the greatest value. Titled “The Characteristics of Mutual Fund Portfolios: Where are the Value Funds?,” the study was written by Martin Lettau, a finance professor at the University of California, Berkeley; Sydney Ludvigson, an economics professor at New York University; and Paulo Manoel, a Ph.D. candidate at UC Berkeley. A third potential problem for P/B is the huge turn in the last 20 to 30 years that the United States economy has made towards intellectual property and away from capital. This very possibly is a trend that has been exacerbated by the decline in interest rates in the last 35 years. In effect, interest rates are one of the prices of capital. This shouldn’t change things for the P/E and price-to-cash flow analysis. Source: Smead Capital Management and FactSet. Therefore, the huge P/E bifurcation in today’s stock market, as shown in the chart above, is a paradise for value investors like us. You can own low P/B stocks in banks like Bank of America (BAC) and low P/E in companies like Walgreens (WBA) Lennar (LEN) and American Express (AXP). We have never given up on the alpha provided or had trouble “holding on to memories” of the blessings in the long run by emphasizing value. Our portfolio enters 2019 at a steep P/E discount to the S&P 500 Index and the Morningstar Large Value category. Valuation always matters dearly to us and our eight criteria for stock selection seeks quality companies which fall into the low P/B and low P/E categories due to what we believe are temporary reasons. Whether it be our decades of investment industry experience or our discipline selectiveness, we like to think we have a “king-size bed” as it pertains to the history of the stock market. Nathanson was appealing to an old girlfriend in his song and Hulbert was appealing to a well-used factor which had produced success for everyone from Ben Graham, John Templeton, Warren Buffett, John Neff and other lesser known practitioners like us. If history is any guide, value will mean revert toward its normal historical rates of success. We believe that over the next seven to ten years, Mark Hulbert (or someone from The Wall Street Journal) will write about what is wrong with growth mutual funds/ETFs and why it is hard to find a fund to buy which emphasizes the kind of growth and momentum factors which have performed so well the last ten years. Lastly, we have a "king-sized bed and a Ph.D. in the way it used to be,” and intend to use them to seek alpha over the next five years. The information contained in this missive represents Smead Capital Management’s opinions, and should not be construed as personalized or individualized investment advice and are subject to change. Past performance is no guarantee of future results. Bill Smead, CIO and CEO, wrote this article. It should not be assumed that investing in any securities mentioned above will or will not be profitable. Portfolio composition is subject to change at any time and references to specific securities, industries and sectors in this letter are not recommendations to purchase or sell any particular security. Current and future portfolio holdings are subject to risk. In preparing this document, SCM has relied upon and assumed, without independent verification, the accuracy and completeness of all information available from public sources. A list of all recommendations made by Smead Capital Management within the past twelve-month period is available upon request.